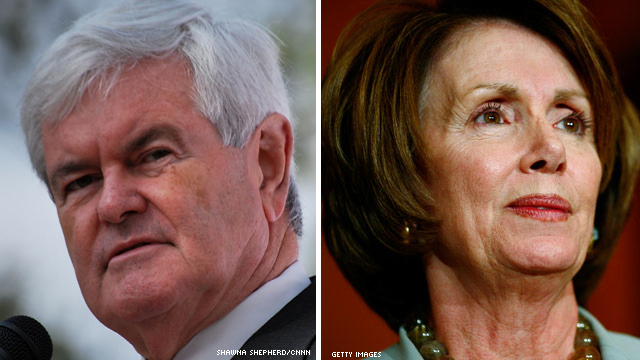 Read the latest Political Ticker writeup on Gingrich's comments about Pelosi HERE. MITT ROMNEY'S FATHER WAS BORN IN MEXICO.......THIS IS PUBLIC KNOWLEDGE, HE SAID IT DURING THE LAST DEBATE. THERE IS NOTHING WRONG WITH THAT,EXCEPT THAT GEORGE ROMNEY WAS A CANDIDATE TO BE PRESIDENT OF THE USA!!!!!!!! HOW COME NOBODY HAS SAID ANYTHING ABOUT THIS????? When are the media going to address the way Gingrich responded to Nancy Pelosi's statement?? Yet again, another white male politician demonizing a powerful female by implying that she is crazy or in a fantasyland. Weak politicians do this all the time when they don't have a solid, transparent response. I only wish the media would jump on this. They did this to Bachman and Palin as well. As a female, I have no time for those who disrespect entire groups of US tax-paying citizens in an effort to change the focus of a topic and avoid addressing a question or an issue raised by a woman. Gingrich just took out a whole chunk of his voting base – women – by tossing out a personal insult/jab about Pelosi's mental and emotional condition. In my opinion, these nasty remarks coupled with the way he dumped two (2) ex wives for another woman – and recently implied that his ex wife was delusional, just makes me sick.